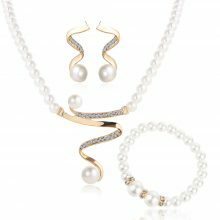 very good, whole set such price for necklace bracelet and earrings! daintily look and made gently. very fast delivery plus courier, uniquely recommend! Delivery time is 7 week, but the product has arrived. Im so happy! Beautiful. Very beautiful set looks very good. An interesting set looks beautiful!